I found a fairly large patch of this native perennial at a local park. 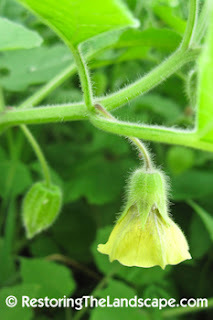 It's growing near the edge of a railway in a somewhat disturbed site in partial sun. What drew me in was the noise coming from bees who were buzz pollinating the flowers. The nodding light yellow, 5 parted flowers are quite beautiful. You have to turn them upwards to enjoy their dark purple-black markings on the inside. 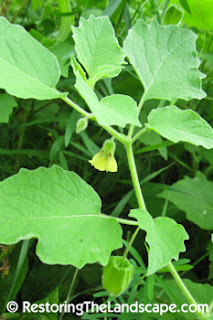 Another very similar native Ground Cherry is the Virginia Ground Cherry (Physalis virginiana), the major difference between the two is leaf shape. The Virginia has narrow lance-shaped leaves, and the Clammy has wide oval leaves. The stem and leaves are covered with fine hairs. Once finished flowering, the calyx forms a bladder-like enclosure around the green berry contained inside. 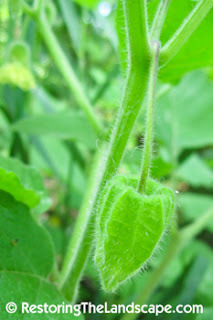 It's very similar in appearance to a Chinese Lantern bladder. 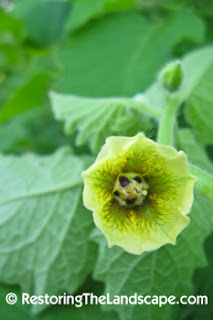 Have you seen Clammy Ground Cherry before?